According to the latest data release from the National Bank of Hungary, the C/A balance turned negative in 2H18. The last time the current account posted a deficit for two straight quarters was in 4Q09-1Q10. This comes after a strong downward revision to the 3Q18 figure, though we expected a deficit in 4Q18. The deterioration of the C/A balance started at the end of 2016, mostly on the back of strengthening domestic demand and capacity constraints in manufacturing. The strong rise in consumption and investment caused a significant drop in the balance of goods, pushing it into deficit in the second half of 2018, and posting the weakest balance since 3Q08. On the other hand, the services balance has slightly improved in the last couple of years, counterbalancing the somewhat negative effect in goods. Looking forward, we expect the C/A balance to stabilise or maybe slightly improve as growth in domestic demand decelerates and new export capacity is used up. In addition, the government is now promoting savings among households, which may lead to fewer imports and contribute to a further improvement in the current account. 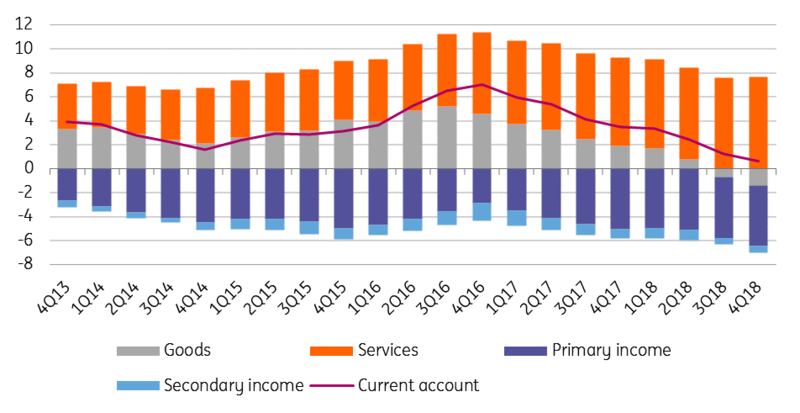 From an external vulnerability point of view, it is more important that the net external financing capacity of Hungary was 2.2% of nominal GDP in 2018. We see this improving somewhat this year due to the incoming EU transfers related to previously pre-financed projects. 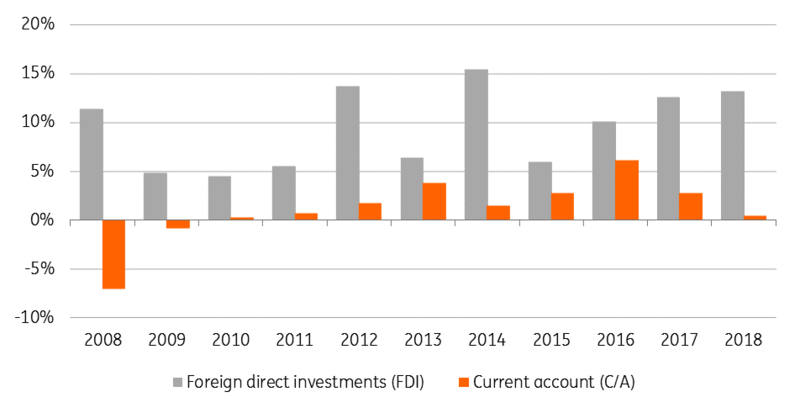 Although the recent current account deficit and the temporary weakness could possibly put EUR/HUF under pressure, foreign direct investment (FDI) is still on the rise, reaching 13.2% of GDP in 2018 overall, 0.6 percentage points higher than in 2017. When it comes to 2019, we see the FDI inflow retreating to some extent but nevertheless supporting the economy and demand for the Hungarian forint.